What Is the Importance of Holy Saturday to the Catholic Church? Holy Saturday is the day in the Christian liturgical calendar that celebrates the 40-hour-long vigil that the followers of Jesus Christ held after his death and burial on Good Friday and before his resurrection on Easter Sunday. Holy Saturday is the last day of Lent and of Holy Week, and the third day of the Easter Triduum, the three high holidays before Easter, Holy Thursday, Good Friday, and Holy Saturday. Holy Saturday is the day between Good Friday and Easter Sunday in the Catholic Liturgical Calendar. The day celebrates the vigil that Christ's followers held for him outside of his tomb, waiting for his resurrection. Fasting is not required, and the only mass held is an Easter Vigil at sundown on Saturday. Holy Saturday is always the day between Good Friday and Easter Sunday. The date of Easter is set by the Ecclesiastical Tables, constructed at the Ecumenical Council of Nicea (325 CE) as the first Sunday that follows the first full moon after the spring equinox (with some adjustment for the Gregorian calendar). According to the Bible, Jesus's followers and family held a vigil for him outside his tomb, awaiting his foretold resurrection. Biblical references to the vigil are fairly terse, but accounts of the burial are Matthew 27:45–57; Mark 15:42–47; Luke 23:44–56; John 19:38–42. "So Joseph bought some linen cloth, took down the body, wrapped it in the linen, and placed it in a tomb cut out of rock. Then he rolled a stone against the entrance of the tomb. Mary Magdalene and Mary the mother of Joseph saw where he was laid." Mark 15:46–47. There are no direct references in the canonical Bible to what Jesus did while the apostles and his family sat vigil, except his last words to Barabbas the thief: "Today you will be with me in paradise" (Luke 23:33–43). The authors of the Apostles' Creed and the Athanasian Creed, however, refer to this day as "The Harrowing of Hell," when after his death, Christ descended into hell to free all the souls who had died since the beginning of the world and allow the trapped righteous souls to reach heaven. The stories originate in the apocryphal text "Gospel of Nicodemus" (also known as the "Acts of Pilate" or "Gospel of Pilate"), and are referred to in passing in several places in the canonical Bible, the most significant of which is 1 Peter 3:19-20, when Jesus "went and made a proclamation to the spirits in prison, who in former times did not obey, when God waited patiently in the days of Noah." In the second century CE, people kept an absolute fast for the entire 40-hour period between nightfall on Good Friday (recollecting the time Christ was removed from the cross and buried in the tomb) and dawn on Easter Sunday (when Christ was resurrected). By Constantine's realm in the fourth century CE, the night of the vigil of Easter began Saturday at dusk, with the lighting of the "new fire," including a large number of lamps and candles and the paschal candle. The paschal candle is very large, made of beeswax and fixed in a great candlestick created for that purpose; it is still a significant part of Holy Saturday services. The history of fasting on Holy Saturday has varied over the centuries. As the Catholic Encyclopedia notes, "in the early Church, this was the only Saturday on which fasting was permitted." Fasting is a sign of penance, but on Good Friday, Christ paid with his own blood the debt of his followers' sins, and people, therefore, had nothing to repent. Thus, for many centuries, Christians regarded both Saturday and Sunday as days on which fasting was forbidden. That practice is still reflected in the Lenten disciplines of the Eastern Catholic and Eastern Orthodox Churches, which lighten their fasts slightly on Saturdays and Sundays. In the early church, Christians gathered on the afternoon of Holy Saturday to pray and to confer the Sacrament of Baptism on catechumens—converts to Christianity who had spent Lent preparing to be received into the Church. As the Catholic Encyclopedia notes, in the early Church, "Holy Saturday and the vigil of Pentecost were the only days on which baptism was administered." This vigil lasted through the night until dawn on Easter Sunday, when the Alleluia was sung for the first time since the beginning of Lent, and the faithful—including the newly baptized—broke their 40-hour fast by receiving Communion. In the Middle Ages, beginning roughly in the eighth century, the ceremonies of the Easter Vigil, especially the blessing of new fire and the lighting of the Easter candle, began to be performed earlier and earlier. Eventually, these ceremonies were performed on Holy Saturday morning. 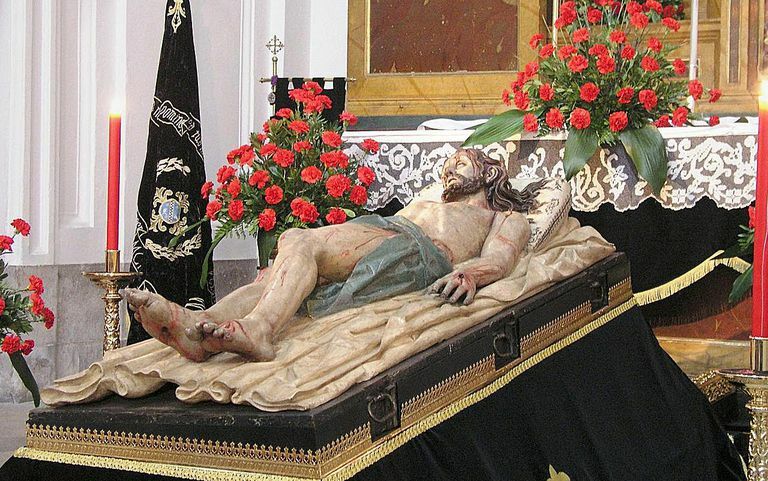 The whole of Holy Saturday, originally a day of mourning for the crucified Christ and of expectation of His Resurrection, now became little more than an anticipation of the Easter Vigil. With the reform of the liturgies for Holy Week in 1956, those ceremonies were returned to the Easter Vigil itself, that is, to the Mass celebrated after sundown on Holy Saturday, and thus the original character of Holy Saturday was restored. Until the revision of the rules for fasting and abstinence in 1969, strict fasting and abstinence continued to be practiced on the morning of Holy Saturday, thus reminding the faithful of the sorrowful nature of the day and preparing them for the joy of Easter feast. While fasting and abstinence are no longer required on Holy Saturday morning, practicing these Lenten disciplines is still a good way to observe this sacred day. As on Good Friday, the modern church offers no Mass for Holy Saturday. The Easter Vigil Mass, which takes place after sundown on Holy Saturday, properly belongs to Easter Sunday, since liturgically, each day begins at sundown on the previous day. That is why Saturday vigil Masses can fulfill parishioners' Sunday Duty. Unlike on Good Friday, when Holy Communion is distributed at the afternoon liturgy commemorating Christ's Passion, on Holy Saturday the Eucharist is only given to the faithful as viaticum—that is, only to those in danger of death, to prepare their souls for their journey to the next life. The modern Easter Vigil Mass often begins outside of the church near a charcoal brazier, representing the first vigil. The priest then leads the faithful into the church where the paschal candle is lit and the mass is held. Catholics aren't the only Christian sect that celebrates the Saturday between Good Friday and Easter. Here are a few of the main Christian sects in the world and how they observe the custom. Protestant churches such as Methodists and Lutherans and United Church of Christ consider Holy Saturday as a day of contemplation between the Good Friday and Easter services—typically, no special services are held. Practicing Mormons (the Church of the Latter Day Saints) hold a Vigil on Saturday night, during which people gather outside the church, make a fire pit and then light candles together before entering the church. Eastern Orthodox Churches celebrate the Great and Holy Saturday, or the Blessed Sabbath, on which day some parishioners attend vespers and listen to the Liturgy of Saint Basil. Russian Orthodox churches celebrate Holy Saturday as part of the week-long Great and Holy Week, beginning Palm Sunday. Saturday is the last day of the fast, and celebrants break the fast and attend church services. "Harrowing of Hell." New World Encyclopedia. 3 August 2017. Leclercq, Henri. "Holy Saturday." The Catholic Encyclopedia. Vol. 7. New York: Robert Appleton Company, 1910. "The Gospel Of Nicodemus, Formerly Called The Acts Of Pontius Pilate." The Lost Books of the Bible 1926.